Gennaro Gattuso oversaw his first win as AC Milan manager as Giacomo Bonaventura struck twice to see off Bologna in a frenetic encounter. Giacomo Bonaventura was AC Milan's hero as they claimed their first win under Gennaro Gattuso at the third time of asking with a 2-1 triumph over Bologna at San Siro. 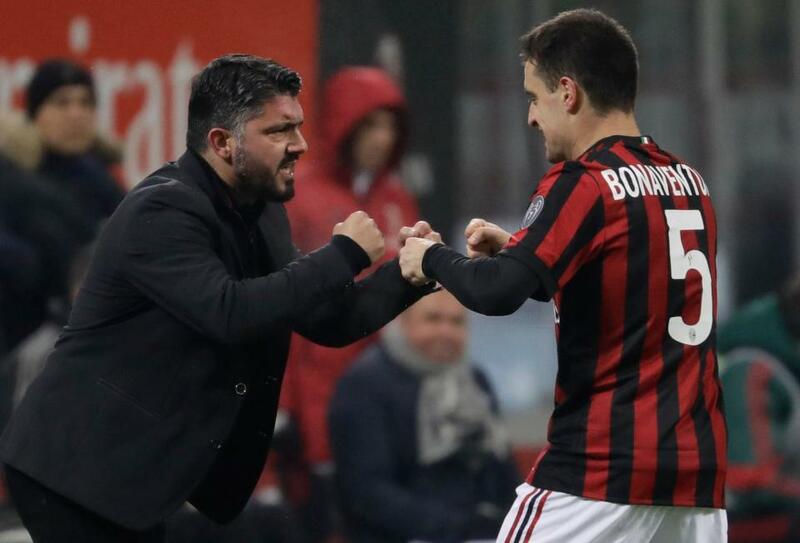 Gattuso, whose reign began with a 2-2 draw against minnows Benevento and a Europa League loss to Rijeka, saw his side start strongly on Sunday and claim a deserved lead through Bonaventura in the 10th minute. However, former Milan youth product Simone Verdi pulled Bologna level midway through the first half and it looked as though the Rossoneri would have to settle for a share of the spoils as they faded in the second period. Bonaventura ultimately came to his side's rescue, timing his run and jump perfectly to meet an inviting cross from Fabio Borini and head home the winning goal with 14 minutes remaining. Milan rode their luck to hold on thereafter and climb to seventh in the table, albeit still a whopping 16 points behind rivals and league leaders Inter. While Gattuso's men had some good fortune in the closing stages, as a deflected effort from Adam Masina struck the bar, they thoroughly deserved their 10th-minute opener, which came courtesy of a simple move. Nikola Kalinic rose impressively to head the ball into the path of Bonaventura and his side-footed shot took a slight deflection off Giancarlo Gonzalez to beat Bologna goalkeeper Antonio Mirante. The hosts initially looked highly likely to pull further clear, but were given a warning when Mattia Destro pulled the trigger eight yards out, only to be denied by a tremendous Riccardo Montolivo block. After Suso had followed up a tremendous mazy run with a poor final ball inside the Bologna box, Destro then turned provider to set up his side's equaliser. Mateo Musacchio was beaten all too easily and Destro then cut the ball back for Verdi, who took a somewhat clumsy first touch but nevertheless finished emphatically into the top-right corner. Bologna were perhaps slightly fortunate to be level at half-time, but certainly looked capable of going on to win the game as the action switched from end to end after the interval. Both sides let themselves down in the final third, though, with a host of promising positions wasted through a disappointing final ball or poor decision-making. When a third goal did arrive, it came out of nowhere, Borini putting in a sumptuous delivery from the right that Bonaventura met with a firm downward header back across goal. Saphir Taider and Erick Pulgar went close either side of Masina's effort looping over Gianluigi Donnarumma and on to the top of the crossbar, but Milan were not to be denied a much-needed triumph, only their third in 11 Serie A matches. - Bonaventura ended a run of 399 minutes without AC Milan scoring at home in Serie A. - AC Milan won a Serie A home match for the first time since 20 September vs SPAL. - Bonaventura has found the net in consecutive Serie A games for the first time since September 2015. - Bonaventura scored his fourth brace in Serie A (the last was in May 2015 vs Atalanta). - Simone Verdi has been directly involved in seven goals (four goals, three assists) in Bologna's last five Serie A matches.